Well there is a first for everything. 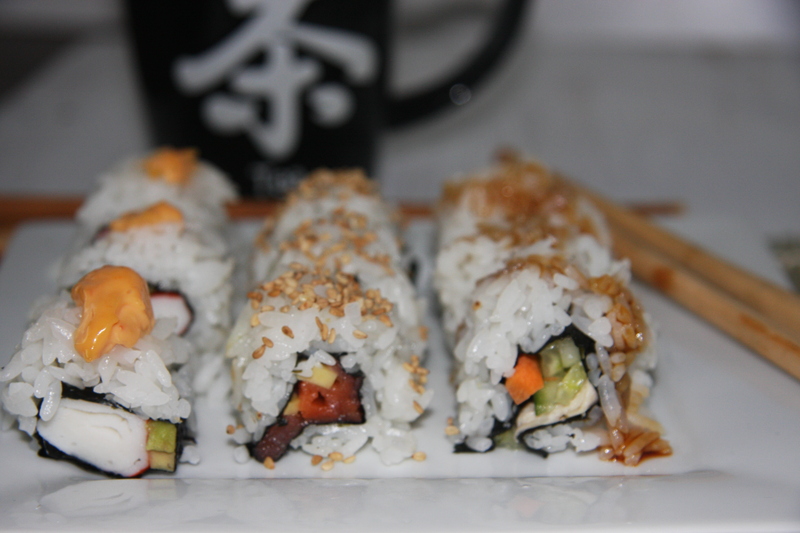 I have never been a fan of sushi nor did I ever think I would make it, let alone eat it. 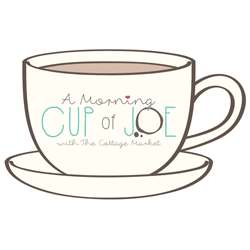 Lately I have heard so much about it and I see it around me even when I go grocery shopping. But still not having a desire to try it. It has just never appealed to me. 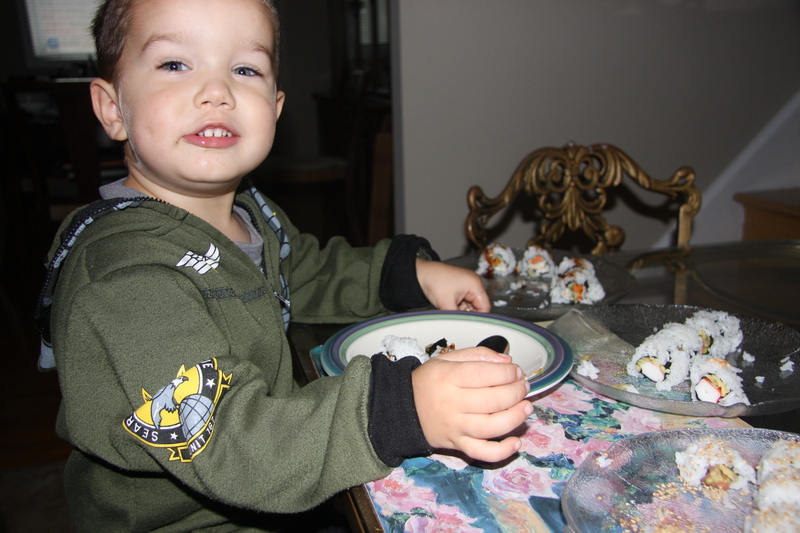 One day during lunch our youngest grandson who is just 3, was eating and turned to me and asked me if I would make him sushi. I knew that all of my 3 grandchildren liked sushi and would ask to go to a restaurant for it but never has anyone of them asked me to make it. Well I couldn’t say no. At the time all I had was pickled herring and thought, why not give it to him on tiny pieces of bread, the way my mother use to give it to me. All the while hoping he would think it was another kind of sushi. I really didn’t think he would eat it. Well I was shocked. He loved it. So then and there I promised him I would make sushi for him next time he came over. 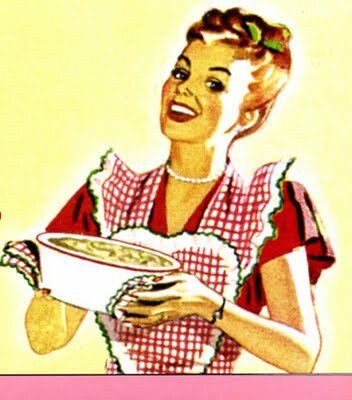 I dug around for recipes and then made up my own. While picking up my supplies I was fortunate enough to be able to watch how they assembled everything at the grocery store kiosk. Though still not being an expert I felt more confident now that I could make this dish that my grandchildren loved. 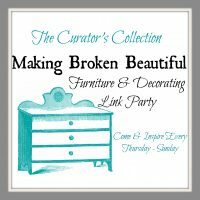 It is quite easy to make and a little goes a along way. I had cut up enough veggies for two batches and still have enough left over for another. I now would not hesitate to order it in a restaurant and eventually I would be adventurous enough to try it with a lot more of the different fillings. One baby step at a time. I urge you to give it a try. 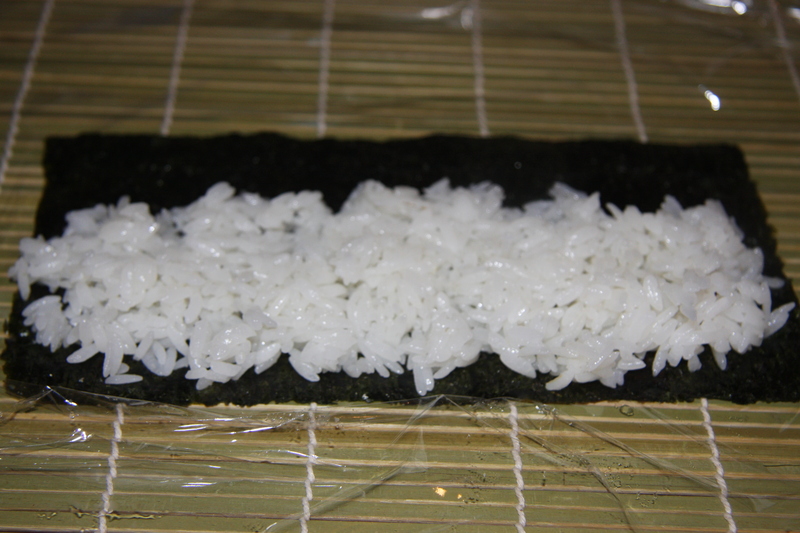 2 cups of sushi rice along with 2 cups of water, which has been washed until the water becomes clear. I then let is dry for 1 hour. 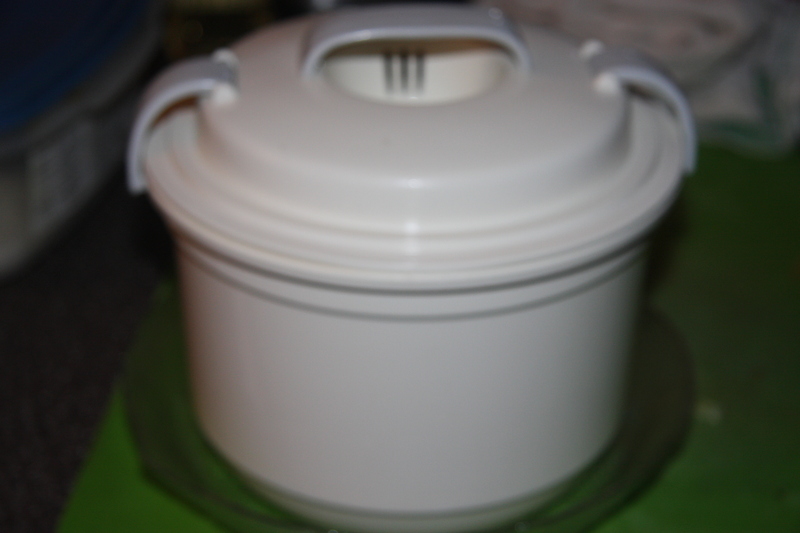 Next into my handy dandy rice cooker. I like to measure the amount of water with my finger. 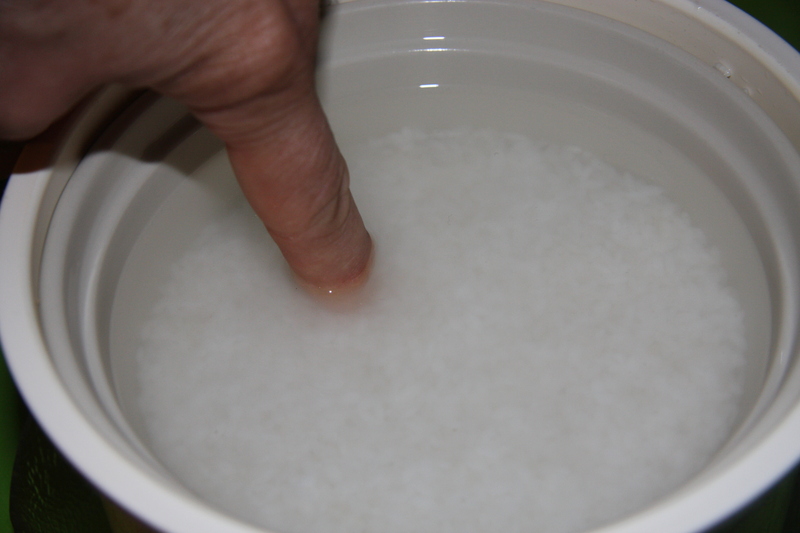 Place the tip of your finger on top of the rice and put in enough water to measure up to your first knuckle. It was a tip a Chinese lady taught me. Next into the micro wave it goes for approximately 12 minutes. Which at the end of this time I check to see if it is done. If not then it goes back into the micro wave, along with a bit more water only if it is needed, for approximately another 8-10 minutes. Though I will check it during this time just to make sure it is done or not. Cool in a bowl. Set aside. 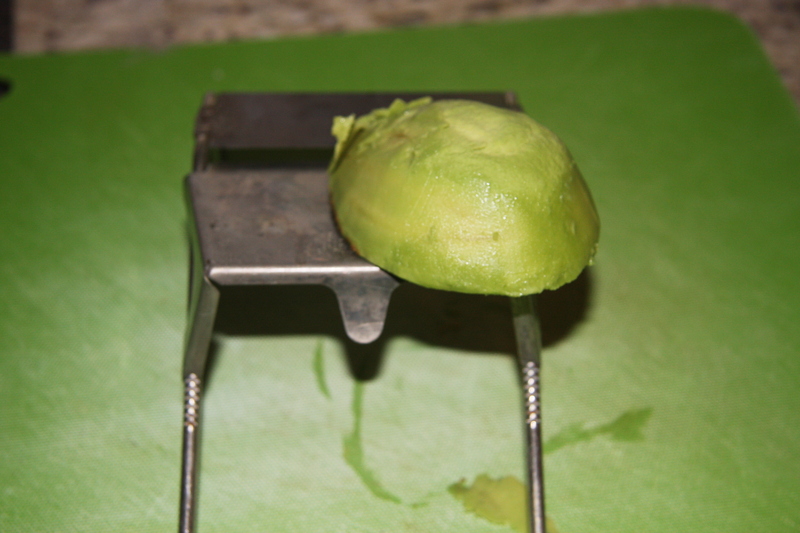 Take an avocado and slice very thin. 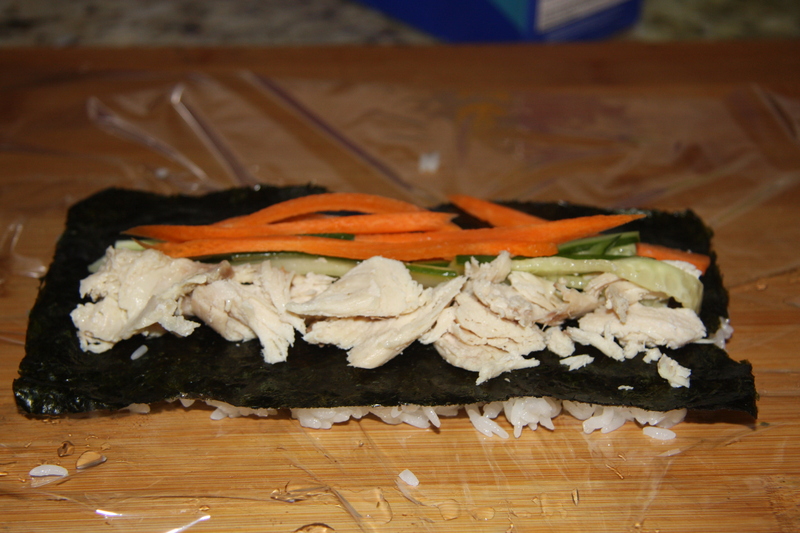 Next slice these pieces into very thin strips. 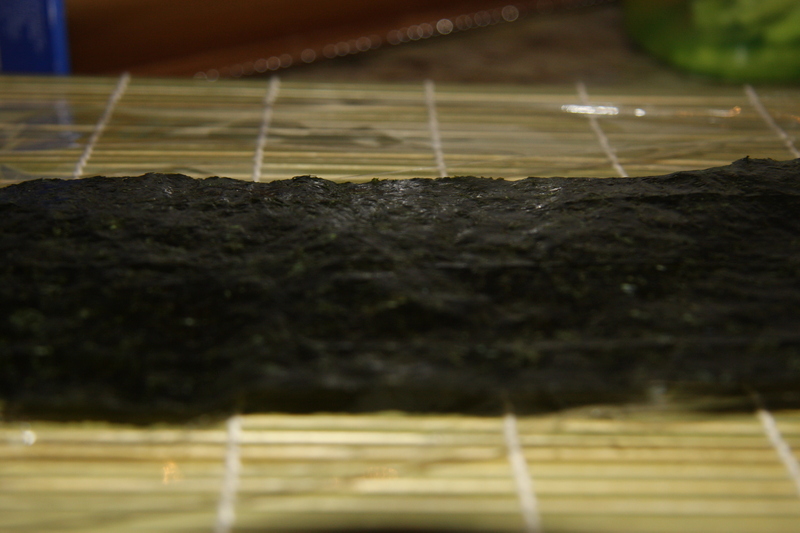 Place some rice on the nori, pressing it while covering the nori. Next flip it over. On the empty side place either cooked chicken. smoked salmon or imitation crab and some sliced veggies. 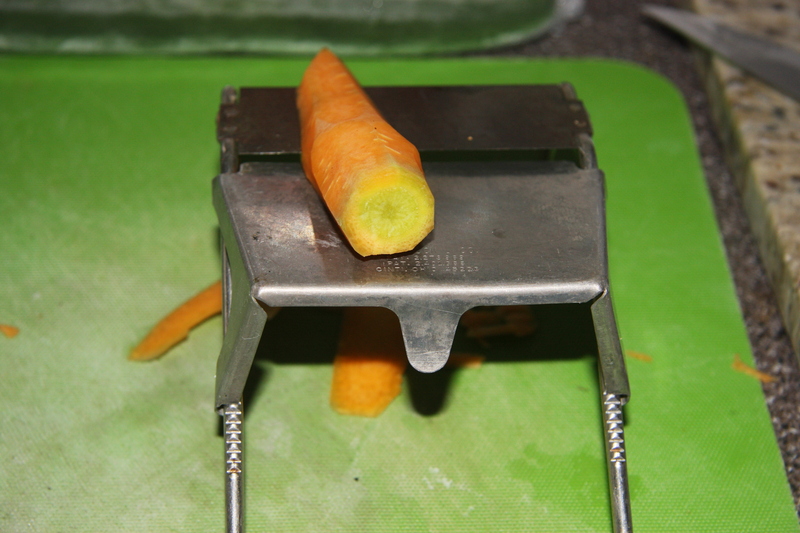 Gently roll it while adding pressure to assure it holds together. Slice with a very sharp knife. I need a little more practice. Not bad though for the first time. 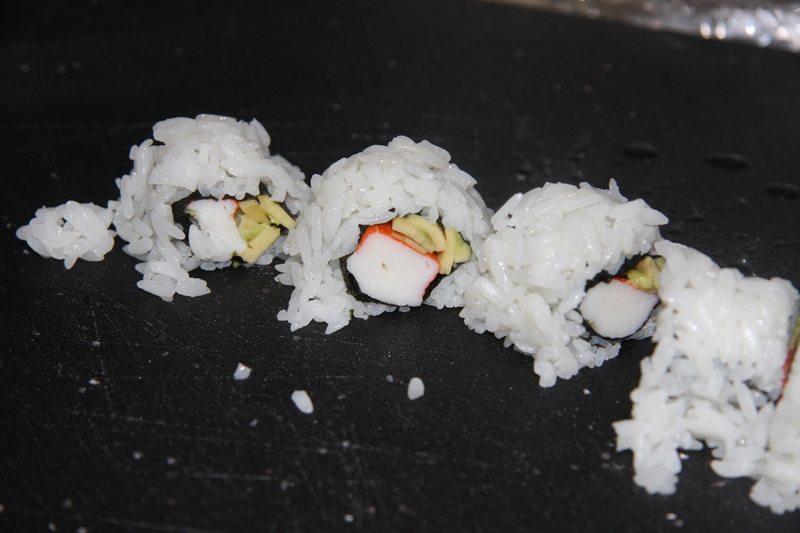 In this roll I used imitation crab. 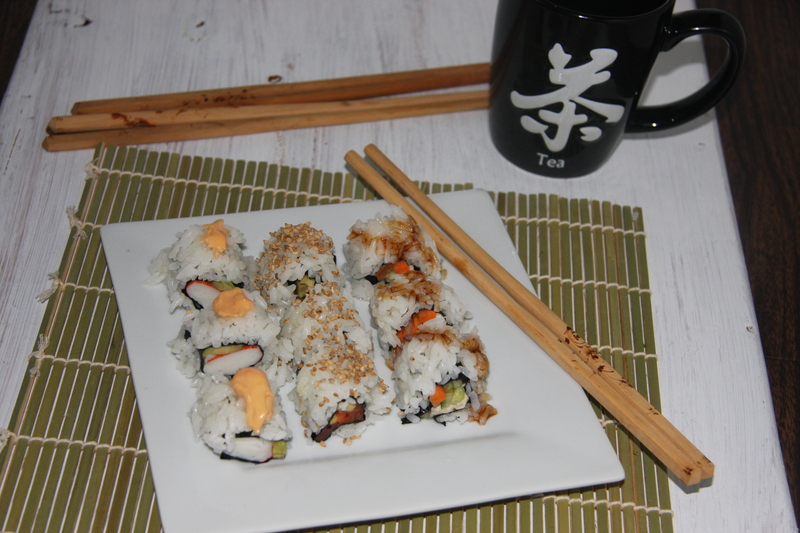 Top with a sriracha mayo, roasted sesame seeds and fish sauce. 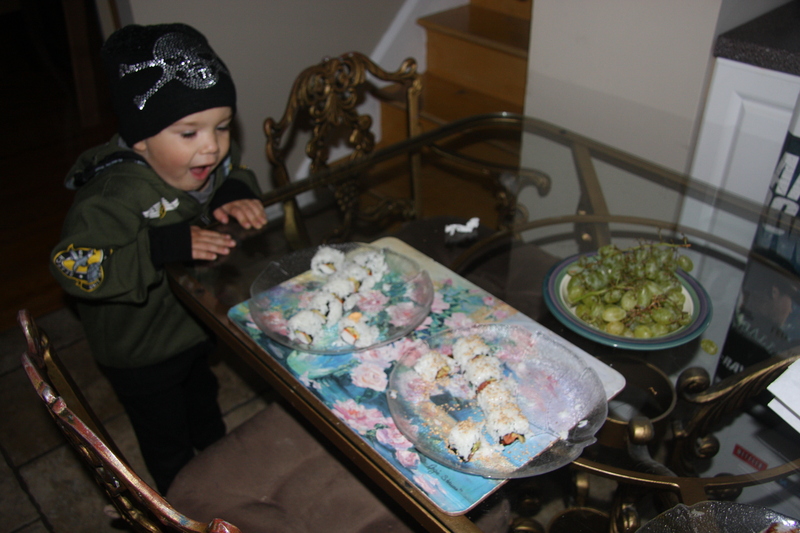 He was so surprised and excited that Baba had made sushi for him. He started to eat even though I hadn’t finished making it. He ate almost every bit. How can you not make this, when you know someone will be so happy? Cook rice according to package. 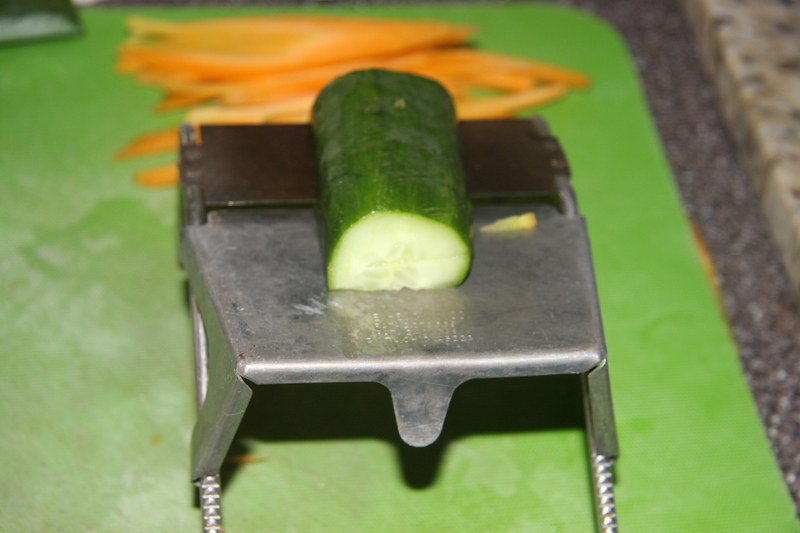 Thinly slice half an avocado, carrot and half a cucumber. Next slice these pieces into very small thin strips. Set aside. 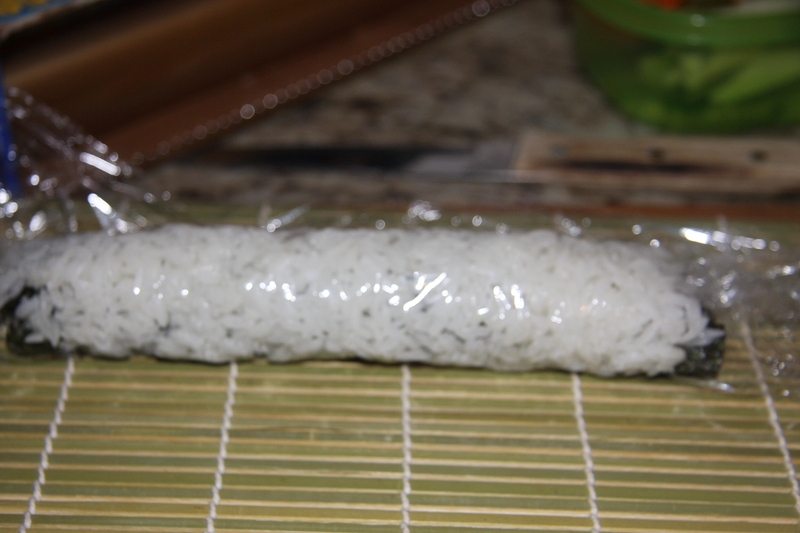 Place a sheet of nori onto some plastic wrap and on the dull side place enough rice to cover the sheet. Then take and flip it over. Onto the green side place some fish or meat, along with your veggies. 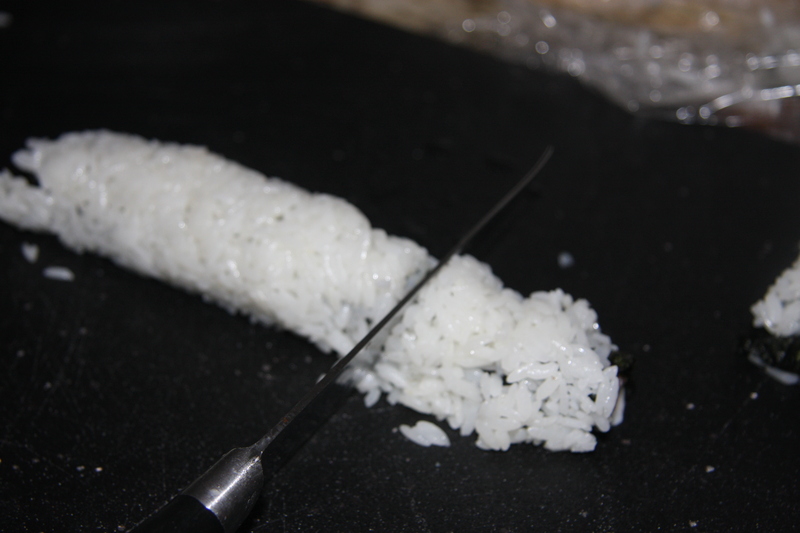 Take the end closest to you and start to roll it, while gently pressing. 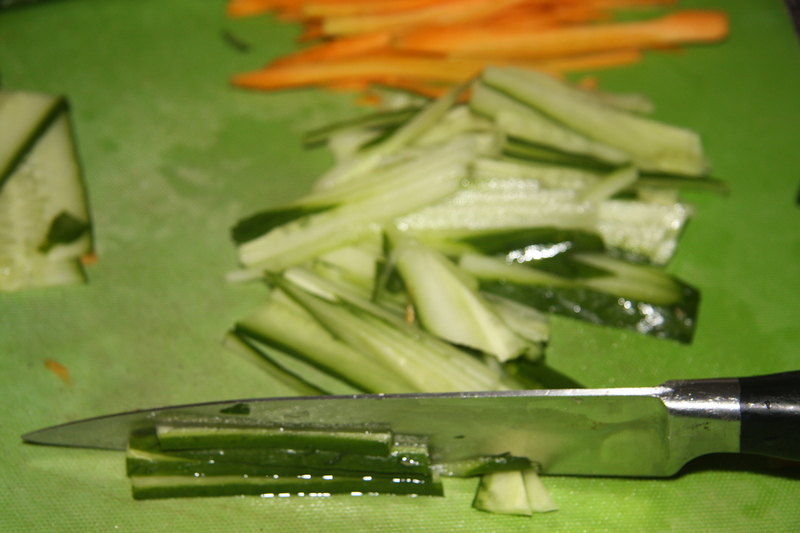 Take a very sharp knife and slice into pieces. Place onto a plate and continue with the rest of the ingredients. 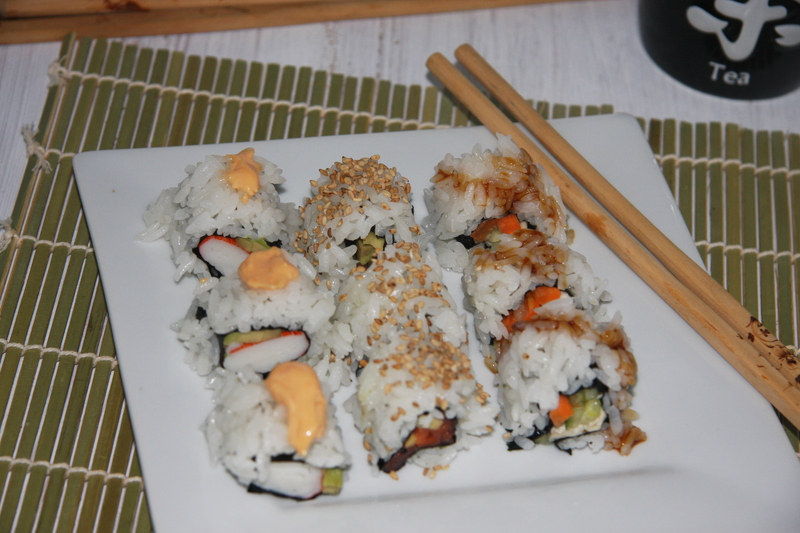 Top with roasted sesame seeds, sriracha sauce and some fish sauce. When finished cover and place into the fridge, until ready to use. He will remember this forever, thanks for being such a great baba!! !